This post is by Cathy Roberts, Teacher – Cambodia. Hello everyone, my name is Cathy Roberts. I am going to tell you a different kind of story about OHI, as I do not have a clinical background. I am actually a teacher, and I teach at Killara Public School in Sydney. 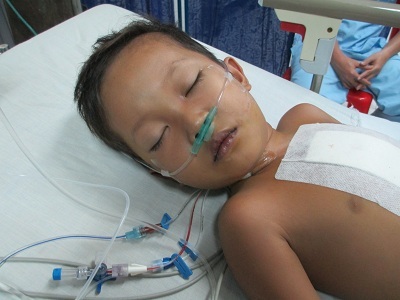 Our school was happy to be the first school to be able to sponsor a child undergoing a heart operation in Cambodia with OHI. The sponsor program for OHI is in its pilot stage, so you will probably here more about it in the future. I feel very privileged to be part of the amazing OHI team and immensely grateful to Killara Public School, the students and their families, for supporting our fundraising event that lead to us being able to support a child to receive treatment in Cambodia. 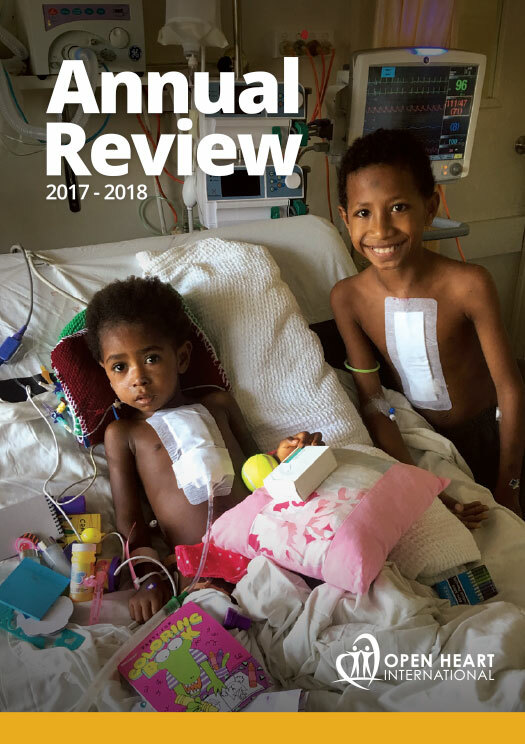 I have really been touched by all the beautiful children undergoing heart operations, and have been drawn to playing with these children in favour of visiting the usual tourist sites. Our school is sponsoring a gorgeous 6 year old boy, his name is Vath. He has pulmonary atresia – which I know now means there is a complete blockage in the usual pathway to blood getting into his lungs from his heart. It is amazing what you learn when you travel with medical types for a while! During my first meeting with him I was struck with how resilient, brave and happy he was despite having blue lips and fingers due to a lack of oxygen. He was engaging, very chatty and loved playing “BOO”. He is currently recovering in Intensive Care and despite being a non medic, I was struck by how his lips and fingers were more pink a few hours after his operation. I cant wait to play “BOO” with him again when he has recovered and transferred to the surgical ward. Open Heart International would like to say thank you to all the children of Killara Public School. Without your support, children like Vath would not have the opportunity for surgery, and enjoy the quality and longevity of life that we take so much for granted. Below is a picture of a very ticklish Vath during screening. He was accepted for surgery, something that all parents wish for their sick children, and on the right is me with Vath before his operaton. His blue lips are really evident in the photo, caused by a lack of oxygen in his blood. We are sitting in front of one of the many colourful posters made by the children of Killara Public School to wish the children well for their surgery. 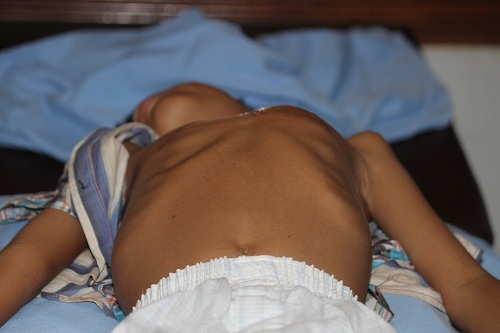 I was fascinated by his asymetrical chest, caused by an enlarged and sick heart. Now Vath has had his operation his heart size should reduce and the asymetry will improve. 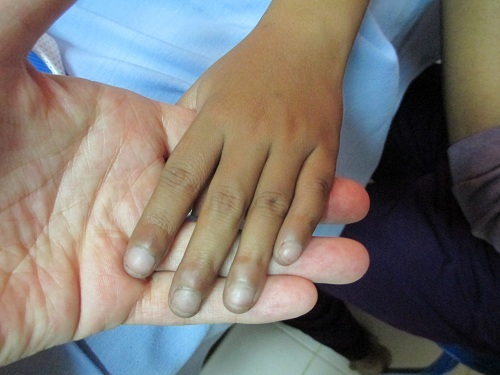 Clubbing of the fingers is common amongst children with congenital heart defects. You can easily see the blue tinge of his finger tips. Vath is presently in the Intensive Care Unit and already his lips are looking pinker. 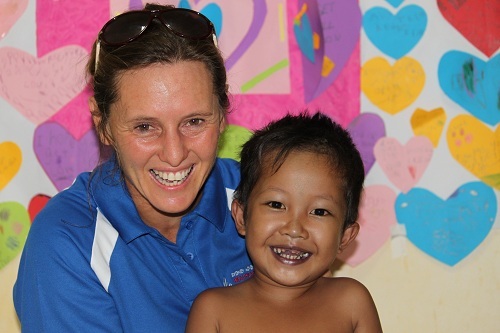 He is under the care of Dr Jonathan Egan, an Intensivist from Westmead Childrens Hospital. 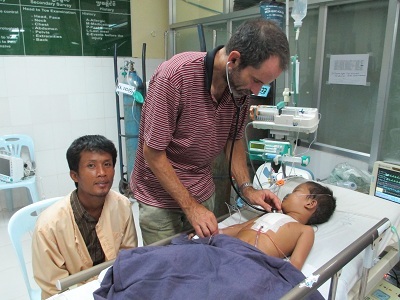 Jono is on call 24 hours a day whilst in Cambodia, and he has been called to assist most nights. When asked if he is tired he states “Nothing a double espresso won’t handle!” Thanks Jono for all of your support of the team and the kiddies.